In a surprising new study, NASA satellite telemetry indicates that an increase in Antarctic snow accumulation is currently adding enough ice to the continent to outweigh the losses from its thinning glaciers. No doubt this data will not sit well with climate alarmists who claim that anthropogenic global warming is destroying the polar ice caps. However, we live in an age where agenda and propaganda trump logic, facts and science. This new study challenges the 2013 report of the U.N.’s Intergovernmental Panel on Climate Change (IPCC) that claims that Antarctica is losing ice. This mantra has the full support of some in the media who propagandize the IPCC’s unfounded claims. According to climate expert Professor John Turner at the British Antarctic Survey, the increase of ice was not expected because “the world’s best 50 [computer] models were run and 95% of them have Antarctic sea ice decreasing over the past 30 years.”1 Actually, the polar caps have been losing ice in recent years, and then they gain it back in the normal growth and loss–for which there are only 35 years of data to compare. Using projections based on computer models, an article from Catholic Online titled “2020: Antarctic ice shelf could collapse,” claims “the rich get richer, the poor get poorer and those polar ice caps keep right on melting. Things have deteriorated so badly – especially the Larsen B ice shelf, that scientist now fear the entire Antarctica ice shelf will collapse by the end of this decade, in the year 2020.”2 It’s not entirely clear how this article links wealth and poverty to melting ice caps, but this is what is reported regularly and will be discussed at the next climate summit in Paris, Conference of Parties, COP-21. The goal is clear for COP-21, they want all nations to adopt a legally binding agreement that will reduce global carbon emissions aimed at keeping alleged warming below the agreed threshold of 2°C, and to acquire the authority to punish offenders. A 2°C limit is quite a safe figure because alarmists know there is little to no measurable warming, so if an agreement is made at COP-21, they can claim the temperatures did not rise because of environmental restrictions. Negotiations in Paris in December will not only focus on participant’s commitments to reduce greenhouse gases, but will attempt to establish a $100 billion per year commitment fund starting in 2020. In spite of the fact that is undefined which First World countries would supply the money, it is intended to help developing countries combat climate change and progress through sustainable development. To put these goals of climate alarmists in perspective, it should be understood as a socialist’s dream come true; something like a modern version of Robin Hood. If made, this agreement will constitute the largest re-distribution of wealth the world has ever seen and will be accomplished through emotional scare tactics and bogus data. To date, there are no proofs that CO2 does anything other than make vegetation grow faster and greener; it simply does not cause an increase in temperature. The greatest greenhouse gas is water vapor and that is not primarily anthropogenic. Arctic ice levels are well within the average measured by satellites since first recordings a mere 35 years ago and are currently growing. Polar bear populations are up. Alarmists predicted global warming super-storms that simply have not materialized. 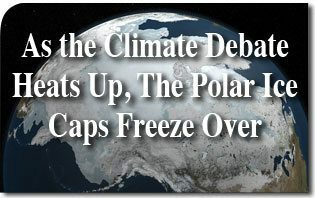 As the climate debate heats up and the polar caps ice over, Mother Nature has not supported the alarmists by providing the prophesized cataclysmic events. It seems painfully clear that the climate agenda has little to do with climate change and everything to do with the destruction of Western civilization. This entry was posted in News Commentary and tagged agreement, alarm, Antarctic, As the Climate Debate Heats Up, cap, change, climate, conference, continent, COP-21, debate, environment, Fact, glacier, ice, Media, NASA, nation, Paris, parties, polar, Poverty, progress, Report, satellite, science, snow, study, Summit, telemetry, the Polar Caps Ice Over, wealth by Gary Isbell. Bookmark the permalink.